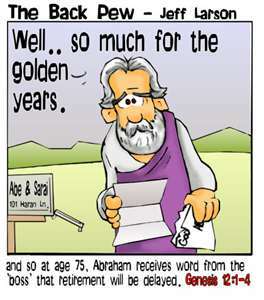 In ancient Israel , it came to pass that a trader by the name of Abraham Com did take unto himself a young wife by the name of Dot. And Dot Com was a comely woman, broad of shoulder and long of leg. Indeed, she was often called Amazon Dot Com. And she said unto Abraham, her husband: “Why dost thou travel so far from town to town with thy goods when thou canst trade without ever leaving thy tent?” And Abraham did look at her as though she were several saddle bags short of a camel load, but simply said: “How, dear?” And Dot replied: “I will place drums in all the towns and drums in between to send messages saying what you have for sale, and they will reply telling you who hath the best price. And the sale can be made on the drums and delivery made by Uriah’s Pony Stable (UPS).” Abraham thought long and decided he would let Dot have her way with the drums. And the drums rang out and were an immediate success. Abraham sold all the goods he had at the top price, without ever having to move from his tent. To prevent neighbouring countries from overhearing what the drums were saying, Dot devised a system that only she and the drummers knew. It was called Must Send Drum Over Sound (MSDOS), and she also developed a language to transmit ideas and pictures – Hebrew To The People (HTTP) But this success did arouse envy. 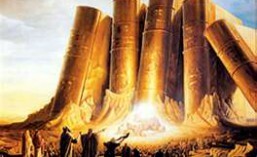 A man named Maccabia did secrete himself inside Abraham’s drum and began to siphon off some of Abraham’s business. But he was soon discovered, arrested and prosecuted for insider trading. And the young men did take to Dot Com’s trading, as doth the greedy horse-fly taketh to camel dung. They were called Nomadic Ecclesiastical Rich Dominican Sybarites, or NERDS. And lo, the land was so feverish with joy at the new riches and the deafening sound of drums that no one noticed that the real riches were going to that enterprising drum dealer, Brother William of Gates, who bought up every drum maker in the land. And indeed did insist on drums to be made that would work only with Brother Gates’ drumheads and drumsticks. And Dot did say: “Oh, Abraham, what we have started is being taken over by others.” And Abraham looked out over the Bay of Ezekiel , or eBay as it came to be known. He said: “We need a name that reflects what we are.” And Dot replied: “Young Ambitious Hebrew Owner Operators.” “YAHOO,” said Abraham, and because it was Dot’s idea, they named it YAHOO Dot Com. Abraham’s cousin, Joshua, being the young Gregarious Energetic Educated Kid (GEEK) that he was, soon started using Dot’s drums to locate things around the countryside. It soon became known as God’s Own Official Guide to Locating Everything (GOOGLE) And that is how it all began. Honestly!!!! !